First three-generational family fitness club brings families together to get fit. It is all about the “famili”! 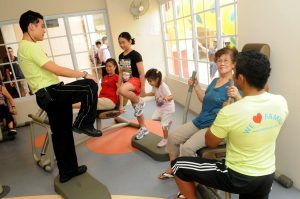 That is what Singapore’s first three-generational family fitness club is all about, which was launched by Dynaforce International in collaboration with NTUC Eldercare and Wellness @ Punggol South. Coined the Famili Club, it encourages intergenerational families to exercise and bond through a variety of indoor and outdoor activities. 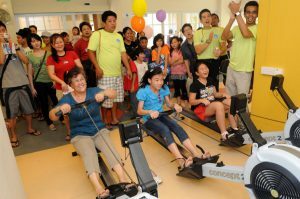 The Club at Punggol South is supported by the Ministry of Community, Youth and Sports and the Council for Third Age (C3A). The Famili Club is one of the six finalists for C3A’s Intergenerational Bonding (IGB) Awards on April 26. The IGB Awards aim to encourage organizations to develop new programmes that promote intergenerational bonding and at the same time, recognize exemplary IG programmes that are being implemented. Explained Jimmie Lee, chairman of Dynaforce, “Forming the Famili Club is in response to the Government’s call to promote active ageing and intergenerational bonding, and to combat childhood and adult obesity. It is also in line with our company’s mission of creating an extraordinary wellness experience for our community by improving their quality of life. “With the Famil Club, we want to provide grandparents with a vocation by giving them the opportunity to take charge of their family’s health. Here, seniors and children will be able to exercise, play and enjoy keeping fit together as a team. As they say, the family that plays together, stays together!” he added. The families can enjoy four main stations that are suitable for the young and old. There is the Easyline Circuit Workout which comprises of eight linked stations, the Indoor Rowing which consists of two rowing equipment where families can compete against each other and measure their fitness progress, the Wii Sports Game Corner which has virtual sports games like tennis, rafting and football, and the Outdoor Freeplay Area where families can participate in 3G telematches and kampong games like chatek. There will also be fitness trainers available to make sure the exercise is done properly. To encourage all seniors and children to exercise together, families will also be able to come dressed as they are, and will be rewarded with fitness products such as waterbottles and towels for participating in activities, achieving fitness goals and winning various family-type competitions. 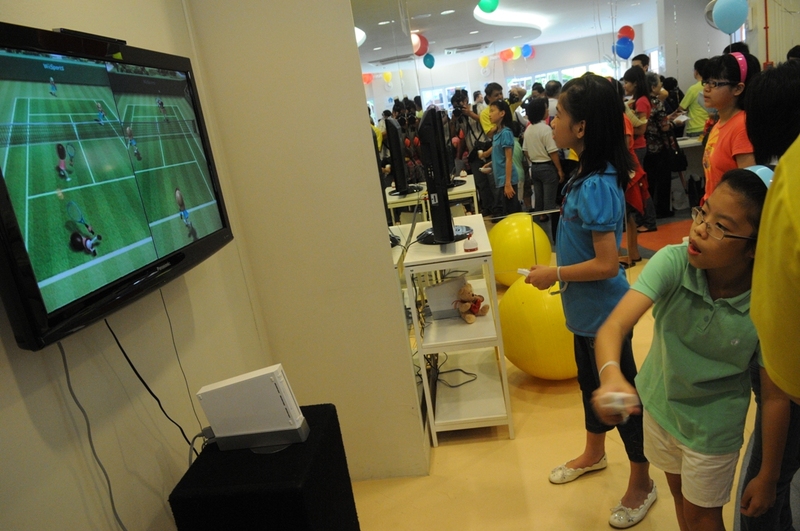 Games Masters will be on hand to track fitness progress as well as educate on proper nutrition by means of health talks, cooking demonstrations and regular healthy grocery shopping trails. There will also be an online nutritionist to advise and answer questions from Famili Club members. Muhammed Pauzi, 49, came to the Famili Club launch with parents Mariam Hussein, 60, and Abdul Aziz Kassim, 75, and his two daughters, Nui Farziyanah, 23, and Syasya Ilyana, 4, and their extended family. He is keen to sign up – “It is about family bonding. We don’t get to exercise together. Now we can keep ourselves in shape and keep healthy together.” He shared the Club is accessible, which is another plus-point for him, and has already designated one weekend to workout together. She added, “The family nucleus is getting smaller and smaller. The children are getting married and moving out, and distancing themselves from their parents. Previously everyone stayed under the same roof, but now we are seeing parents living on their own.” With the Famili Club, she sees that the families have the opportunity to come together. Asked if more such Clubs are on the way, Lim explained that there would be two more Famili Clubs – one in Dakota in July and another in Bedok in January. The response has been positive so far. 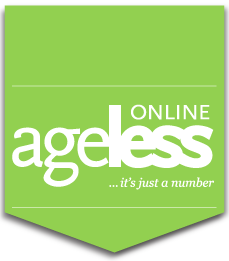 As of the launch in March, 100 people have signed up to join the Club and they represent some 50 families. To be a member, the cost is $80 a month for six members of the family, with special discounts for those who pay one year or six months ahead. The Club is located at block 571, Hougang St 51, #01-119, and opens from Monday to Friday, 7am to 9pm, and Saturday and Sunday, 9am to 5pm. For more information, go to www.familiclub.com.